If you need more cooking flexibility with limited space requirements, the Avantco CO-16 half size convection oven is a great way to make pizzas, baked goods, snacks, warm sandwiches and more right on your countertop. This 1.5 cu. ft. oven boasts 1600 watts of heating power and forced-air heat circulation for even cooking, and can hold up to four, 1/2 size sheet pans at one time. Four chrome wire racks are included so you can begin baking right away! Plus, cooking temperature can be adjusted up to 500 degrees Fahrenheit, and a built-in 120 minute timer lets you know when food is cooked to perfection. DO NOT BUY AN AVANTCO OVEN! We purchased 2 of these ovens for our 2 coffee shops in November. We only bake 2 or 3 sheets of pastries per day. The first one stopped heating in Feburary. After going back and forth with Avantco they finally replaced it. Now the second one has stopped heating. After reaching out to Avantco again we are told they only have a 6 mo warranty. SIX MONTHS!!! The irony is we bought these ovens to replace quarter-sheet ovens we bought at another company that we had no problems with for 3 years. We hoped to increase our capacity and "upgrade" to commercial ovens that only lasted months. So we have gone back to using our other brand oven. Save yourself the frustration. If you need what you bake to cook evenly, this oven is not a good choice. The outside cookies on my pans will be burned, with the ones on the inside not being cooked enough. I wish I had not selected this oven. I have bought 2 in the last year both quit working after 6 months, one fan stopped working other heating element. Complete crap don't waste your money. Thank you for your feedback! We are sorry your Avantco CO-16 Half Size Countertop Convection Oven, 1.5 Cu. Ft. - 120V, 1600W was defective. Corrective action has been taken and a Customer Solutions Representative will remain in contact with you about this. Thank you for your review, Paula! We are sorry this Avantco CO-16 Half Size Countertop Convection Oven, 1.5 Cu. Ft. - 120V, 1600W has not worked well for you. A Customer Solutions Representative will contact you soon! really, really happy with this purchase. The oven is compact, heats quickly, is easy to get working out of the box, and does the job. This unit works as well as can be expected for a countertop oven. It's 'convection' qualities leave much to be desired. The edges are definitely hot spots and baked goods baked off in here are mediocre when compared to baked goods baked off site in our large convection oven. We use this unit in our very small restaurant for toasting of bread, finishing off of par-cooked bacon to get it to crisp, and daily baking of scones and cookies on site. It's interior size is its best feature. I personally like that it does not have an automatic timer to turn off. I would purchase this unit again if ever necessary. This oven is simply amazing. I purchased it for personal use in my RV - because RV ovens are so bad! This oven rivals my dual convection oven in my house! I love it! Even baking - I have baked so many items in this already - cookies, breads, pies, cakes, rolls, etc. There is nothing this little gem can't handle - and the price point is amazing! I would buy this over and over and over again! We bought this oven for our small batch bakery. It is the perfect size for counter top use. Our only complaint is there seems to be a hot spot, but that is easily remedied by turning and rotating product half way thru baking times. It isn't super loud and doesn't put off nearly as much heat as we expected. it is perfect fit my bakery store and works well so far, highly recommends to other people who want to buy it. great quality and design. Oven started off decent. 5 months in and cookie still bake unevenly. Everything in the back of the Oven gets too hot and burns unless you rotate trays of cookies. I’ve dropped temperature from 350 degrees to 320 and still the same result. Cookies dry out more compared to other commercial ovens we have. Now my big issue is the oven is now not getting hot. I can get anyone to call me back in regards to the situation. I need it fixed or the oven replaced because it’s a key part of my business as we are a mobile cookie truck. We use this in one of our food trucks. I prefer this one over the quarter size. You can fit a little more in it. The convent size is easily transported between our locations and for special events. It is easy to use and can be set up any where. Another successful install in a customers concession trailer. Very nice quality and finish. Got it on sale making it a bonus. If it goes on sale again will buy more. Although I measured this now that its on the counter it feels much larger than I thought it would. The openings between the racks are also relatively low so you can't bake anything very tall. Perfect size for use in small restaurant or food truck kitchens, very good quality for the price all stainless steel comes protected for the shipment. There is a learning curve to using this oven but overall it does a decent job. We like to use it for our flatbread pizzas because it warms up quickly. This oven is great for a small space and small cooking needs. We tend to refer to this oven as "our easy bake" oven due to its small size, yet works great in a limited amount of prep space. I have never had or used a convection oven before so this was a new toy in the kitchen. this thing really cooks fast, in many cases twice as fast as a conventional oven. this means a lot to a small store with limited staff. I can really get fresh made orders out quick. very well built unit, only negative to me is that it could use a better, more precise, timer. I have a magnetic digital timer mounted on the front of the stove that I can set to the second and this solves my timer problem. overall it is an excellent product. Great oven!! we used it for cheesecakes and it worked great bake everything nice and evenly and was a perfect size that fit into a small area. Perfect size oven for a small business! I have a bakery I use it for, no exhaust system needed for use. I am to fit 4 quarter sheet trays inside or two trays of 1/2doze cupcakes. So small but definitely gets the job done! I love this new oven! It's perfect for home use and the instructions are simple to read! They had forgotten the racks however, once I contacted them about it, it came immediately and I was excited about using it. The oven is very good at baking cakes, cupcakes and cookies! For bread, it doesn't work too well however, you have to open the oven and turn it in certain angles to make sure the bread browns evenly. Not a problem since I usually bake cupcakes and cookies. I totally recommend this! This oven has been great for the couple of months we've been using it. Definitely follow the instructions and run the oven at least a day before service so you can get rid of the plastic smell it ships with. As soon as I got the oven I tried it and it works very well, I recommend turning the product in the middle of the cooking time as it burns on one side more than the other. I would have given 5 stars if the fan was a little faster. I haven't used this oven enough to have mastered the art of convection yet, but I am definitely liking it! Seems that there is a sweet spot to find in just how much to lower the temperature and/or adjust the baking time. But it's certainly not rocket science, and practice makes perfect. Great little oven! great for tight spaces and cooks for the most part evenly. I did although have to take the fan shroud off and re adjust the fan, kind of an inconvienence as I did have to do some work. Best price on the net! The Avantco portable countertop ovens are great. They heat up pretty quickly and are easy to move, which is very important for our catering team. One issue we have found is that with frequent opening the door will become loose and the oven loses it seal. We may have to repair our. That being said however, these are great ovens and we highly recommend them, especially if you need a portable oven for catering gigs. This oven works great. Never had an issue with it. Heats thoroughly. We us this for heating sandwiches. Lots of space inside can fit up to 6 in the oven. I have only had these ovens for a couple of months, but as of right now, I love them. They were extremely affordable, stack easily, and hold a lot of food. Other reviewers are right in noting that most of the time, you won't actually use 4 sheet pans in them because of the limited height - really the only thing I've been able to do that with is bacon or other flat meat products, like sausage links, etc. But you can certainly fit 3 cupcake pans or anything like that with no trouble. Great buy! The Avantco CO-16 Half Size Countertop Convection Oven was purchased for our coffee shop to do small pans of cookies, cakes & quiches. The small countertop size allows more work space for the other equipment. Good product for the price. Only down side is the temp runs lower than indicator. Agree with other reviews about protective sheeting being difficult to remove, but hey, no scratches on it. We use this item daily to make all kinds of baked treats. It heats up quick, has a ton of cooking space and is sold at a awesome price. Cleaning is easy! This is a great over! Had to adjust the door gasket but still worked well. Very happy with the purchase and the customer service from WR. This is a great priced product. Heats up quickly and cooks quicker than a standard residential oven. I can fit more product in at one time. I had noticed that the seal that suppose to press on the glass wasn't making contact in some spots, so some heat loss is happening and hard to tell if it is holding temperature. Maybe the seal will seal itself after I use the product a while. As far as the functionality of the oven, it does everything it should and does it pretty well. It's slightly uneven and has some "hot spots" but for an affordable oven, I think you have to expect this. I am overall really happy with the oven. Works great for warming up our pastries and baking cookies. The one thing is it did just stop working completely one day. I contacted Webstaurant directly, with in just a few short minutes, I got a response back from Webstaurant saying they had heard back from the manufacture and are either sending me a brand new one or giving me credit to purchase a different product. I have to say, I was going to give this unit a much lower rating but because of the incredible customer service, I am giving it a 4 star rating. Hope this review helps! This has been a great little oven. Unfortunately when it arrived the door on it was shattered, however, I called it in and a new door was delivered within 3 days. Great response from customer service! They have always been very helpful when I have had any issues! These Avantco Half-Size Countertop ovens are great for those tight spaces where a traditional standing oven just won't cut it. These are lightweight but still sturdy and made very well. 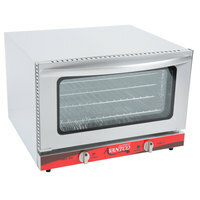 The Avantco CO-16 Half Size Countertop Convection Oven, 1.5 Cu. Ft. - 120V, 1600W is the perfect size for what we need. Next we will be ordering more items to use with it! i can't believe this oven is as strong as the turbofan. i have used this oven to bake my macaron and it turn out amazing. We have purchased several of these ovens and each one has worked perfectly.. The price is the best around, and even though this oven has a low price it is well made. Oven gets hot quickly and cleans easily. Great oven Took a couple replacements but it works great and would recommend this for your needs. I can fit full size pans and roasting pans in it. This item came with a piece unattached, once we figured out it was reverse threaded it went back in to place easily. We have limited space in our kitchen and this oven does a great job for the size. We have issues keeping the temperature regulated and the adjustment dial seems to be a bit off. We bought an inexpensive oven thermometer and that makes it easier to regulate now. We are looking at buying another to stack. It cooks nicely for the size/cost.